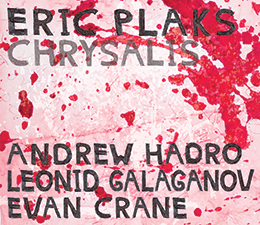 On his tenth and most recent album, Chrysalis, on Out Now Recordings, Plaks offers a program featuring 6 written themes (including two which honor David S. Ware and Cecil Taylor) alongside three sumptuous and spontaneous group compositions. In addition to Plaks' provocative piano, listeners will be thrilled by the huge and gorgeous sound of Andrew Hadro on baritone sax, bass clarinet, and b-flat clarinet, the earthy bass of Evan Crane, and the supple and gem-like drumming of Leonid Galaganov. Pianist Eric Plaks was born in Princeton, New Jersey, and attended Harvard College. A student of the entire history of jazz, from the most traditional forms to the most modern styles of creative improvisation, Eric began his performing and recording career when he moved to Harlem in 1996. He has appeared in various formats and venues in New York City and the wider world. Eric is known for his distinctive form of pianism, in which listeners have heard the accents of Taylor, Shipp, Crothers, Abrams, Waldron, Hill, Monk, Ra, and Ellington.